The purpose of the Club is to support and promote ALL athletic activity groups at Oswego East High School by uniting students, parents, coaches, faculty, staff, and community in a way that enhances the sharing of school spirit, and provides moral as well as financial support and to assure the ongoing improvement to all Oswego East High School athletic programs. What is the cost to be an OE Sports Booster member? STANDARD Membership - $45 annual membership. Meetings are held the first Monday of each month at 7pm in the OEHS LRC. We extend an open invitation for you to join us in making a difference at Oswego East! Your time and talents will be put to good to use in helping the Booster Club's tradition of improving student athletes' experiences at OEHS. 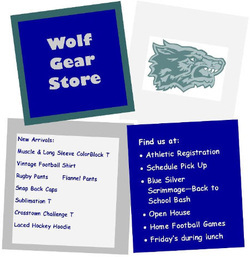 Show your Oswego East spirit and stop by the Wolf Gear Store! You'll find t-shirts, hoodies, hats, blankets, and much more! Questions? Visit the Sports Boosters page or contact Sandi at tearchic2003@yahoo.com. 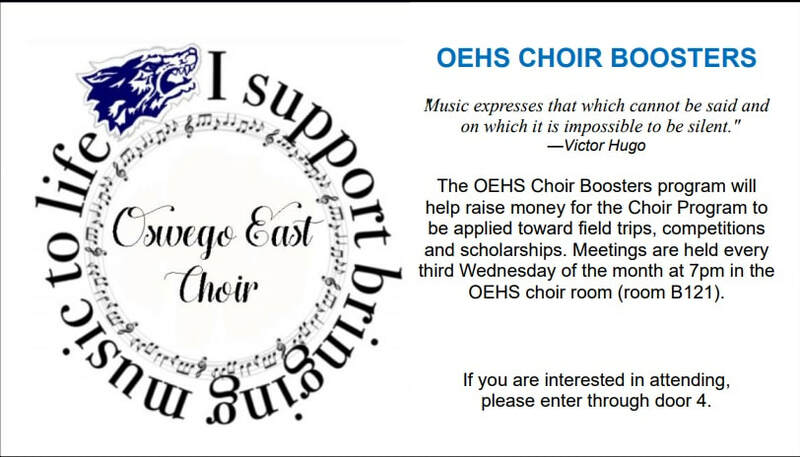 All adult family members of OEHS Band Students are welcome to attend the OEHS Band Booster meetings. Meetings held the first Tuesday of the month in the OEHS Band Room (enter through door #3). Most meetings finish within an hour. During the meetings, upcoming band related events are discussed.